Recent changes in Android Market search algorithms and results were analyzed and presented to the San Francisco Android User Group. We studied hundreds of search results and came to some very interesting conclusions. During the summer of 2011, Google made significant changes to the Android Market. They added a number of new elements, modified the user interface and changed the algorithm used for displaying search results. MarketImpacts.com studied these changes and presented their results at a meeting of the San Francisco User Group. A video of the presentation can be found on YouTube and the slides used in the presentation can be found on the MarketImpacts.com website. "We had just released the QuickClick suite of Android apps on the Android Market in the summer of 2011 when we discovered that Google had simultaneously made significant changes to their Market," said Don Cowan, Director of Software Engineering for MarketImpacts.com. "We were highly motivated to understand why our apps were appearing where they did in Android Market search results," said Cowan. "We studied hundreds of search results and collected inputs from developers on message boards around the world. We came to some very interesting conclusions." "One element that Google was dealing with was keyword spamming in app descriptions on the Market. To get their apps to come up in as many search results as possible, some developers were cramming their descriptions with keywords. This produced a lot of irrelevant search results." "In response to this, Google seems to now be giving much more weight to keywords in app names and the first sentence or two of the app description. This limited text real estate forces developers to declare what their app is all about. As a result, search results become more relevant." "This can be a challenge for apps with fanciful names having nothing to do with the real nature of their app. One solution for developers with these kinds of app names is to include a meaningful keyword or two in the app name along with the fanciful name. This can cause apps that have been penalized in search by the new algorithm to move back up in the results." "In summary," said Cowan, "we think the changes Google made were beneficial, but they might take some getting used to for some developers." 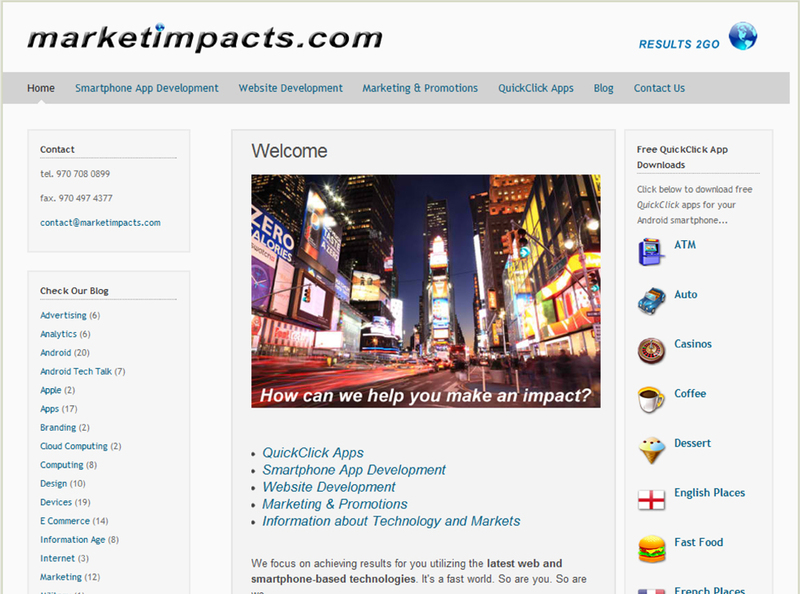 The Marketimpacts.com team develops software for smartphones, tablets and PCs. Marketimpacts and QuickClick are trademarks of Arelinda Technology Group, Inc.
For more information, visit http://www.marketimpacts.com. Android Market Search Presentation SlidesPresentation was delivered to the San Francisco Android User Group. MarketImpacts.comMarketImpacts.com offers Android development services. 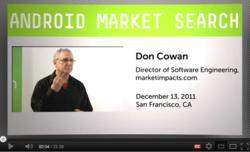 The QuickClick series of apps was release in the summer of 2011.The apps helped MarketImpacts.com gain insights into the Android Market app search function.